Persona 5 'The Animation' Episode 1 Review | Nerd Much? A year ago, Persona 5 released in America and created a “Phandom” worldwide. It served as both a gateway into the Persona series as well as a masterful title that redefined the JRPG genre. With success comes spin-offs, and with a 100+ hour story, there’s plenty of material for a long running anime adaptation. 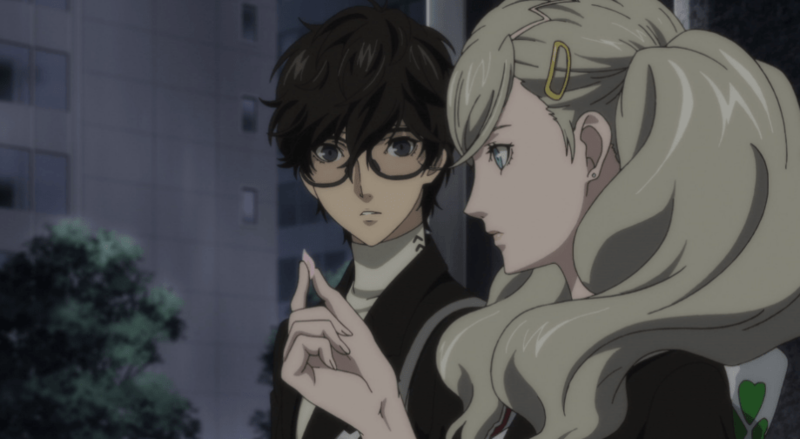 Yesterday, on April 7, 2018, Crunchyroll and Hulu released an English subtitle version of Persona 5 ‘The Animation’ Episode 1, “I am thou, thou art I”. Find out if the Persona anime is worth a watch, and how it compares to the game’s introduction. For those who haven’t played the game, the anime does a great job of mirroring the story and hooking you in. Starting with the bright lights of the late game Casino palace, the anime shows a beautiful clip of a seemingly successful heist. A young man with a mysterious cloak, signature mask, and wicked smile attempts to escape as his team member shoots the glass. After leaping through the glass and hearing words of encouragement from his friends, the boy is about to get away. Lying in pain in the interrogation room, the mysterious masked figure is revealed to be a high school student. He has been drugged, beaten, and waterboarded for a confession. The man interrogating him is the director of law enforcement, and has no remorse in his interviewing techniques. He mentions that he has several felonies against him, including murder. 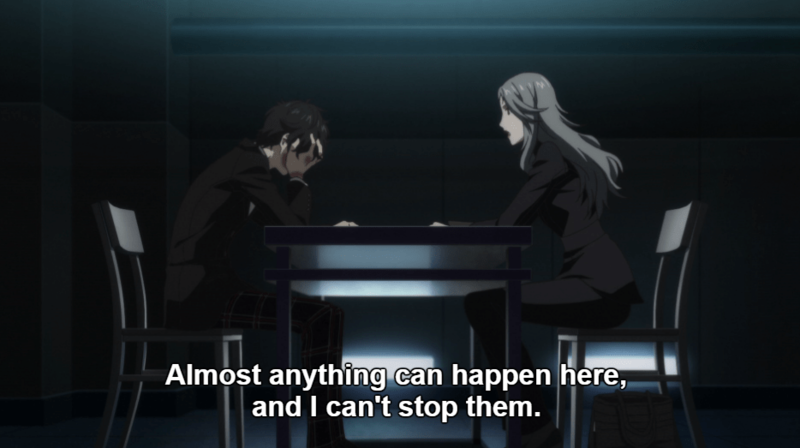 A woman with gray hair, a black suit, and purple eyeshadow steps in, demanding to question the boy to get some answers. She disagrees with her bosses harsh and illegal interrogation, and longs to seek the truth. Then, the boy hears a voice and sees the butterfly notifying him of his second chance, the bonds of those around him saving him. At this point, the anime sets the stage for the story to come. Although much of the text in the game was omitted due to the time constraints of a 20 minute episode, it never felt too rushed from this point and until the end. Those who haven’t played may want more details, but those will definitely come as the anime moves along. Viewers now see the boy on a subway to Shibuya. Before this, there are some minor flashbacks to his past and why he is arriving. To keep it short, he’s considered a delinquent. 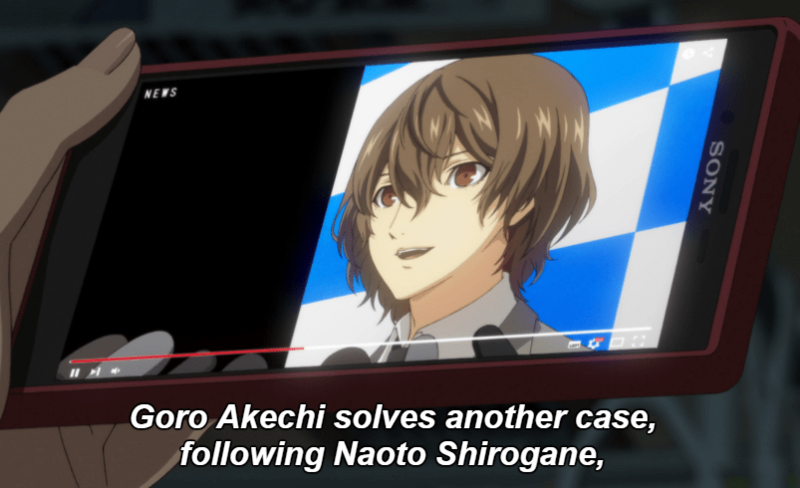 During the subway scene, viewers may recognize the Persona 4 easter eggs, including the mention of Naoto Shirogane and the Rise Kujikawa billboard. It’s a really nice addition to have a homage to one of the predecessors of the series. Walking to LeBlanc’s coffee, the boy meets his new guardian, Sojiro Sakura and introduces himself as Ren Amamiya. Pulling a classic name change from the manga, this new name may confuse some fans. Sojiro is a bit cold, but his initial rudeness is not captured as well in the anime as in the game. This could have been because the anime episode was on a time crunch, which is completely understandable. His character will probably show more in the coming episodes. Ren is then told he will be part of Shujin High School, and he walks to his dingy new room, the attic of LeBlanc Cafe. Throughout the episode and especially at this point, there are hints of some of the supernatural elements to the game. First, the mysterious “cognitive shutdowns” including a subway driver who went off the rails. Second, the app that just won’t delete. Third, the transfer into a prison cell in another world, where our main character is in prison garb and meets Igor. None of this is fully explained yet, but it doesn’t need to be. It’s good for foreshadowing what’s to come. Ren has an encounter with the beautiful blonde pigtailed girl, Ann Takamaki. Here, they cross paths for the first time as she adorably grabs a cherry blossom from his head. Although subtle, it was a cute extra scene they added. The scene cuts to her entering the car of a creepy teacher, which will be explained more in the next episode.This was a good point for the story to move forward without it being too rushed. Soon after, Ren meets Ryuji, a brash blonde haired boy who gets transported into the Metaverse, an alternate version of the world with “palaces”. The school transforms into a castle, and our first target, Kamoshida is there with his sparkly robe and undesirable speedo. They are attacked by guards, with Ryuji wounded. It’s here where Ren hears the voice of his persona, Arsene, and awakens his ability. The awakening scene was beautifully animated and even better than the cutscene in the game. His face bleeds as his persona is summoned and a new outfit is formed. As soon as he forms a contract, the episode ends at a really nice point. The best thing about this episode was that it got through two hours of gameplay without it ever being too rushed or skipping over any important details. The team behind the anime kept the pace at at nice level, and here’s to hoping it will keep up in the upcoming episodes. It’s really difficult to depict a really long game with lots of details so well, but this episode exceeded expectations. Throughout the episode, the wonderful soundtrack mirrored the scenes within the game. It’s well done. However, the opening song that appeared at the end of episode 1 was a new song by Lyn. It’s spectacular, catchy, and fits the rest of the Persona 5 soundtrack. Here’s to hoping they have a new ending song too! A-1 Studios has high quality animation and it really showed in episode 1. The awakening scene was done very well. Some of the stills and scenes seemed a bit dull in color, but the rest of the episode was very nice. Fight scenes will be key in the upcoming episode, especially since Persona 5 is turned based. It will be interesting to see how the personas are animated. It’s the set up for the world to come with some ambiguity for newcomers, so it’s not 10/10 yet. However, if the anime keeps up at this pace, it’s destined to be one of the best video game adaptations out there! 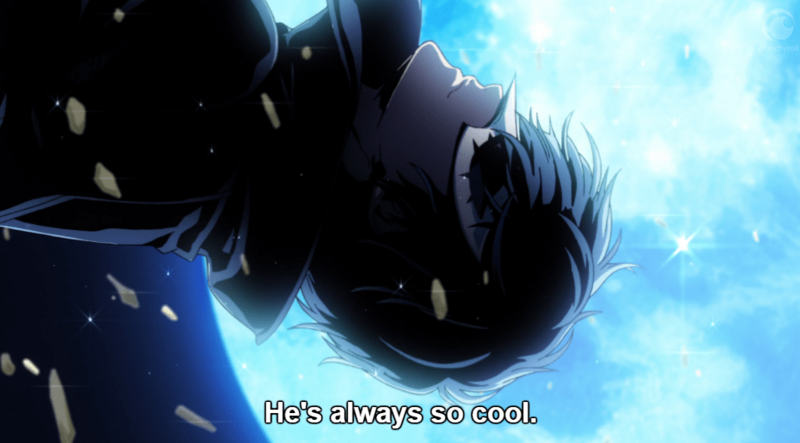 It’s no “last surprise” that Persona 5’s anime already impressed us, and we are beyond excited for the 24+ episode retelling of the game.